Piyawara has touched the lives of the children in Mahakachchakodiya, an underserved community in the Vavuniya District, with the construction of its 48th preschool and added another Piyawara Preschool to the national network. 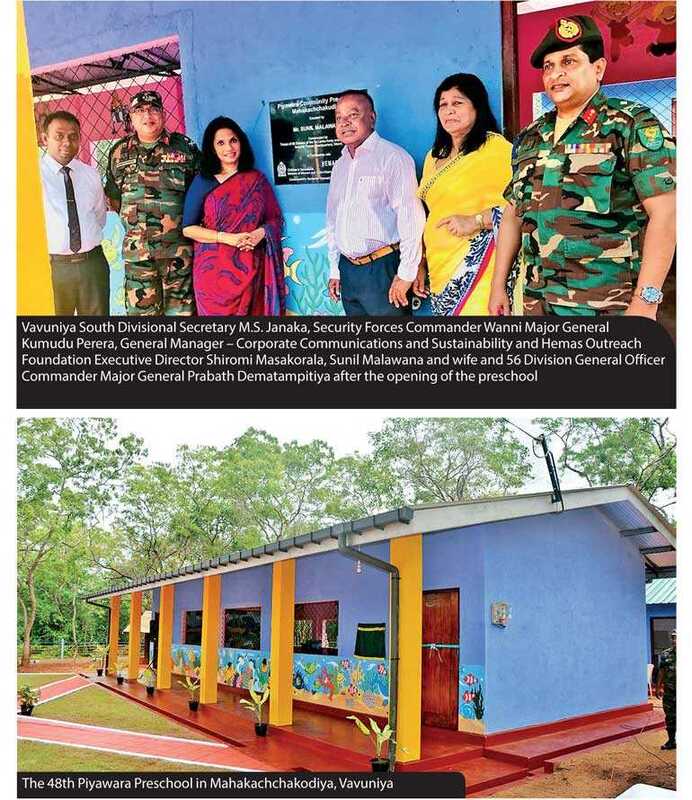 The school was donated by Sunil Malawana and his wife and constructed by the Sri Lanka Army. Present at the opening ceremony were the Malawanas, members of the clergy, senior Army officials, Government officials, Hemas officials and the families from the community. Addressing the community Sunil Malawana emphasised on the importance of the preschool education and early childhood care and development in Sri Lanka. He also thanked the Sri Lanka Army for its commitment and building the school in a short period of three months. Initiated in 2002, the Piyawara project was launched in partnership with the Children’s Secretariat of the Ministry of Women and Child Affairs. The project aims to enrich the lives of underprivileged children of Sri Lanka focusing on key aspects within the framework of Early Childhood Care and Development (ECCD) providing a holistic approach to preschool education. At present the 47 ‘Piyawara’ Preschools across the country has over 115 teachers and over 3,500 children attending them daily. Piyawara, the flagship community project of Hemas, stands today as a successful and a sustainable initiative demonstrating the success of Government-private sector partnerships in addressing national issues and creating strong communities.